At the foot of Kili there were literally hundreds of porters getting ready to load bags and depart through the rain forest region which covers the first day’s ascent. Mega-bus loads of aspiring hikers were also getting out the buses and making their way to sign indemnity forms and pick up their pack lunches. I could feel the excitement in the air.. The weather was misty and in true rain forest fashion sporadically opened up from time to time, and we were constantly on and off with the ponchos. It was mostly all up-hill for the next 6 days, to which point it then fell off rather sharply to put it in nutshell. 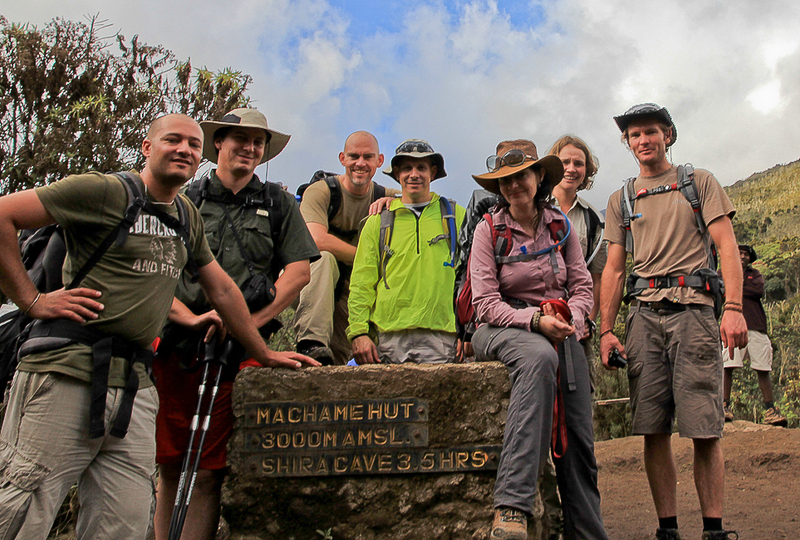 From Machame gate we walked for around 6 hours through the most amazing thick trees and foliage. My camera was filled with members of our group posing as Smeagol- hiding in trees, or sporting fake moustaches made from ‘Oupa se baard’ (Grand dad’s beard) which grows in strings from certain trees in the forest. Lunch was taken undercover as the clouds decided to open up again, just as I unwrapped the cellophane from a large oily samoosa. For some reason it wasn’t perceptible that we were at an altitude which already rivalled that of the higher mountainous regions of the Drakensberg. Moving up the slopes the flora was abundant as you would expect, but strikingly so was the Kilimanjaro Impatiens which is found nowhere else in the world except the jungle floor of Kilimanjaro! 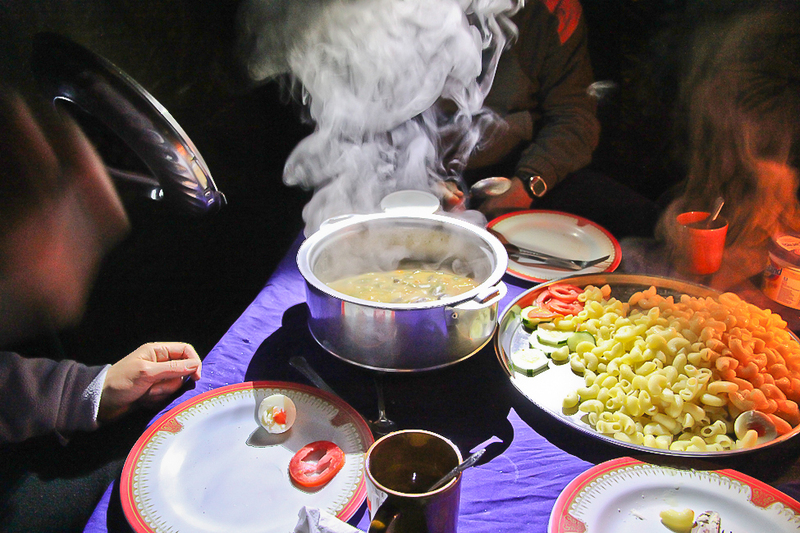 By about 3pm we strolled into camp, tents were already pitched and coffee was brewing above a coal fire. These guys are amazing- it must be said the porters truly do a great job. 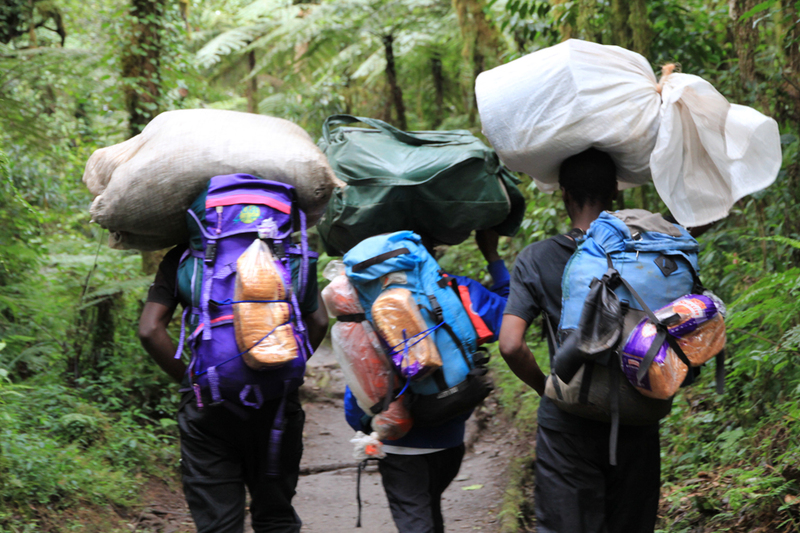 Imagine- these guys (and sometimes girls) carry up to 30kg of YOUR stuff, mostly on their shoulders, up a mountain and are constantly over-taking you on the way up, week-in and week-out. After checking in at the office (each camp has a constructed office building -ensuring everyone has arrived in one piece) we cleaned up with warm water in a bucket- heated once again by the porters. Ate dinner early, had a pep talk by our chief guide, Tom and crashed. It was a sound nights sleep- I remember waking up only once during the night for a bush pee and nearly careered off the side of the mountain in pitch darkness after tripping over a tent wire. Up at sunrise- definitely worth it.. I must say that I was very disciplined- I woke up every morning before sunrise to take photos. 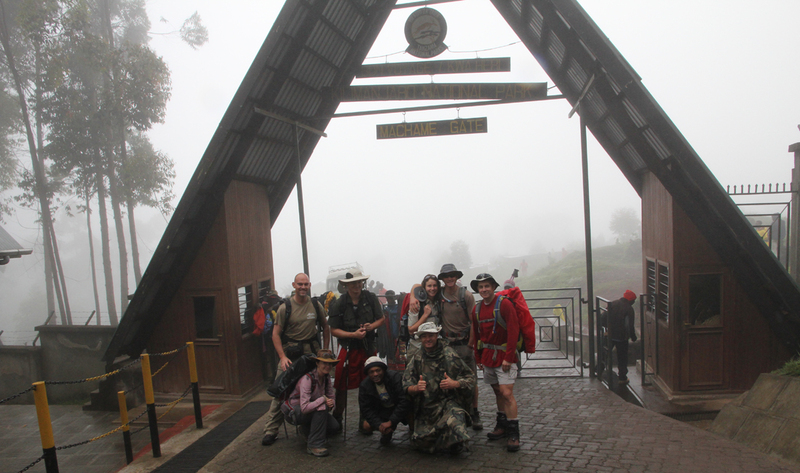 We were headed for Shira plateau today, our next camp, approximately 3200 m above sea level. Now its only a 200 meter advance on day 1, but the route is designed to ascend and descend throughout the trip in order to help one acclimatise. We arrived 7 hours later at Shira plateau. It was a lovely easy walk- we had left the forest behind now and it was a good change to be out in the sun. 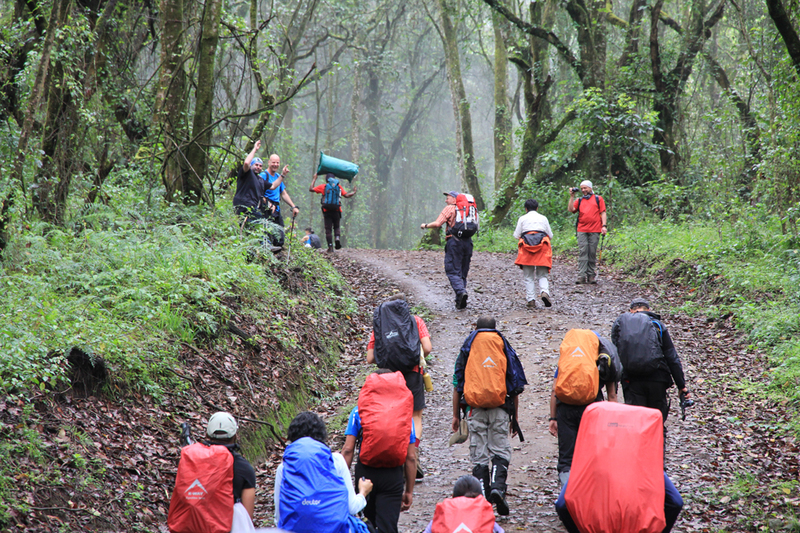 Looking back as we left Machame, revealed a layer of low hanging clouds suspended above the canopy and there was a certain devilment in our steps as the troop ambled on. Arriving in Shira the mood turned as gloomy as the mist which rolled in at about 3pm. The view from here was truly epic (when it cleared). On one side you can see the sister peak Mawenzi and beneath that, city lights. On the steep side, the snow-capped peak of Kibo, a giant enshrouded up to his neck in the clouds. After tea and a quick wash I grabbed my camera and headed off. Some of the pictures here would be my best. 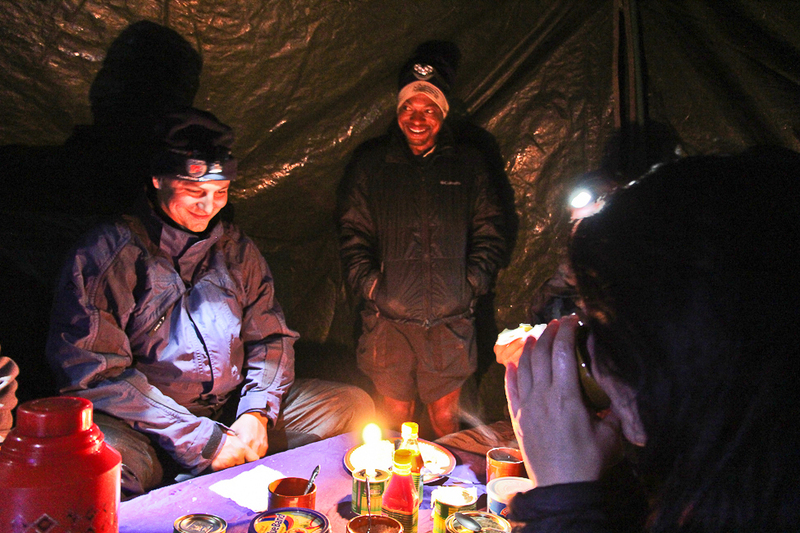 We sat down to another amazing hot meal prepared by our outstanding porters.. David didn’t pitch up for dinner, first sign of mountain sickness. . poor guy. I was feeling great, kind of on a high, my ears slightly ringing but somewhat with a strange heightened sense of awareness.